Once every month for the last year, I’ve re-posted from the old blog all the Knitstrology posts. This is the last in the 12 part series. This one was originally posted on January 30, 2012. Dreamy, creative artists, you’re likely to be (or dream of being) a knitting designer. You’ve got the patience and introspection to be quite successful at this endeavour. Your knitting friends really appreciate your presence at knit night. You’re always very giving, make a great teacher, and give out a general chill vibe that makes the whole evening quite pleasurable. You’d go out of your way to help a friend; overheard a conversation where she said she was missing just one skein of that colourway to finish this project that has to be done rightnow! You dive to the bottom of your stash where you know the saviour skein lies and you deliver it to her home the next day. 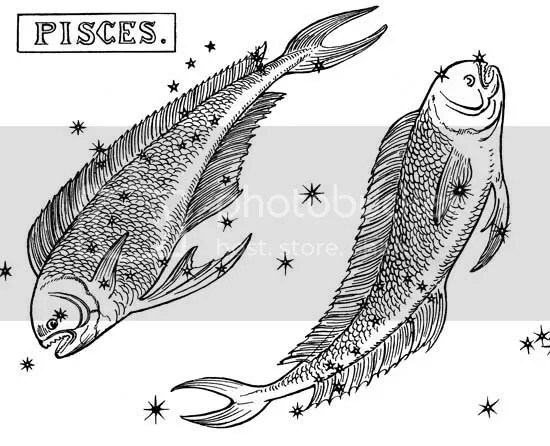 This could also be a bit of a Pisces’ downfall. You’re so very sympathetic, you might take on your friend’s worry and make it your own! Focusing on the ways you so naturally help those around you might ease this stress. This giving, thoughtful and sensitive nature leads you to, indeed, be something of a knitting-for-others knitter. Those who are worthy of your knits rejoice! Though perhaps not the best at working to a deadline. Just send along that Leo friend’s birthday gift in November – they’ll be just as pleased to receive it then. Pisces rules the feet, so get those dpns and superwash yarn; it’s sock time! Mauve, lilac and sea green are colours sure to make a Pisces smile. Start your Piscean projects on a Thursday or a Monday. They’re lucky for you. This one was originally posted on January 26, 2012. Ok, let’s get down to brass tacks, here: you have great initiative. Indeed, you might have been the person who set up the knit night group in the first place. Where you fall down is your reticence to ask for help, and false pride to see that you might need it. You’re pretty methodical, so believe you’ve picked out a pattern that perfectly suits your skill level and desires. But you make mistakes too, and can find yourself lingering in unhappy-project hell due to your unfortunate mistake. 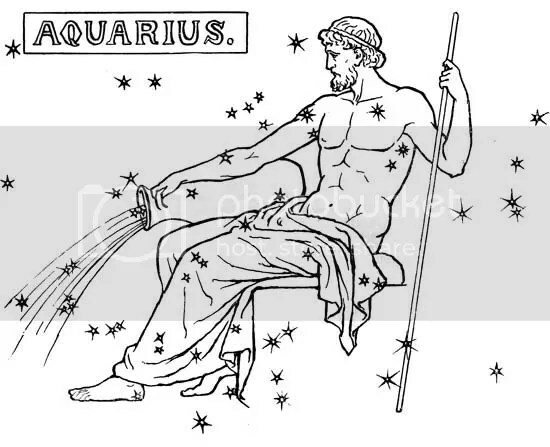 You’d make a great teacher; you have the patience to sit there with someone and go over technical details and you love to feel useful, just like the other earth signs Taurus and Virgo. You’re someone who knows how to do things, and get things done. You set high standards for yourself and for others, and will accomplish that goal, climb that mountain, and reach the summit of whichever-challenging-project you’ve picked. Many knitters turn to you for advice. Your practical and well-thought out responses always seem to solve the problem of which lace shawl should I knit for my sister’s wedding, and, do you think I’d actually get use out of this poncho? 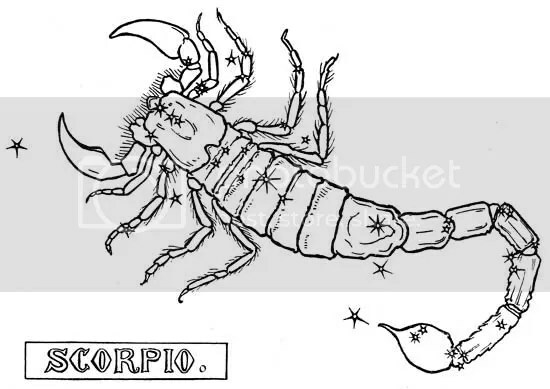 You are very practical and possibly the most resourceful sign of them all. Your projects will likely utilize the perfect yarn in your stash, and be something that avoids overly trendy looks that might be out of style sometime soon. A beautiful, traditional aran sweater or fair isle gloves will suit your tastes just fine. 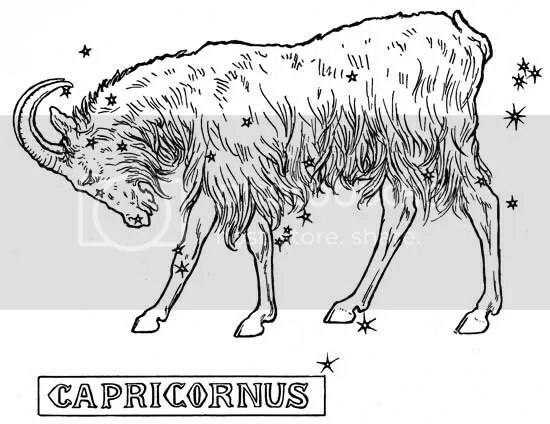 Capricorn rules the knees and lower legs. I think some legwarmers are in order! Lucky day Saturday! Start your projects then. Gift a Capricorn a skein of brown, grey or black yarn and they’ll be very pleased. This one was originally posted on January 25, 2012. 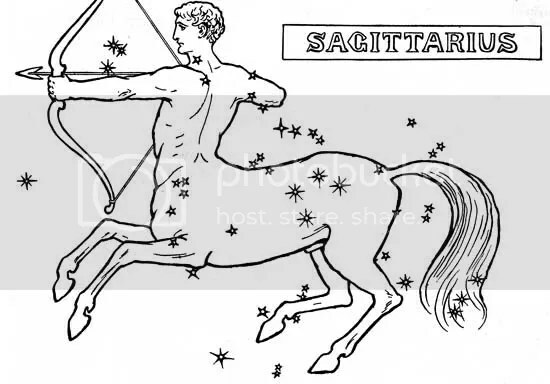 Halloooo Sagittarius! I’m very glad to see you! You’re such a positive, optimistic person, it’s a joy to know you. Others you knit with will say the same thing. They’re glad to see you walk in the door. You’re a great example of a positive approach to life; even when a particularly stubborn pattern or technique is causing you problems, you don’t let it get you down. You can take repeated troubles or disappointments with aplomb. Knitting is great for you; you love starting new projects, and there’s always a new one in every skein. You’re a very forward-thinking individual, and I have to say, it’s really rather difficult to write anything bad about you! Your blind optimism can lead you to carelessness. Fortunately for you, it’s not such a big deal if you chose the absolutely totally wrong-o yarn for a particular project. Just start again with another! 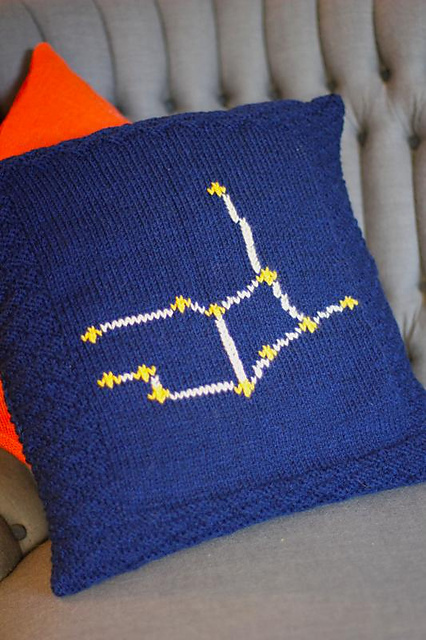 It could be tricky to find you at knit night – you’re restless, and might not be so very reliable a face around the table as a Taurus or a Libra. Exploration is your thing, so finding new places, new people and new yarns are right up your alley. You can be impatient (you know, wanting to move on and all), so your projects might tend to be either small or unfinished. Sagittarius rules the hips and thighs; shall I suggest you make some legwarmers? Possibly a knit skirt? The lovely colours of violet, purple and red are sure to please the Sagittarius. This one was originally posted on January 21, 2012. Your easy going, sociable nature makes you a much welcomed fixture at thesesame knit nights. Others appreciate the vibe you set out, making knitting in a group a great way to unwind after a busy day. You love beautiful things, and seeing all the gorgeousness of other people’s knitting is very pleasing. You’re the diplomat of the group, balancing out difference of opinion and finding a good, common way to maintain harmony. It’s true, people’s hackles can be raised if such a salacious remark as “continental is the only way to knit!” is spoke, but you’re very good at calming those treacherous waters. You may think less of someone for buying (in your humble opinion) cheap, horrid and useless yarn. But my goodness, you’d certainly never say anything about it! You loathe confrontation, and keep your “sophisticated tastes” to yourself. When it comes to projects, you like your sophisticated, pricey and luxurious yarn. Unfortunately, you don’t care for tedious, hard work, and will usually either work in very quick, simple projects or be a habitual starter and stopper of knits. Those quick projects are also a great choice for you, since you’re sometimes indecisive and changeable. You’re artistic and talented, but might steer away from that intricate, 2,000-hours-of-work-shawl due to your underachieving tendencies. Friday’s you’re lucky day to start projects. 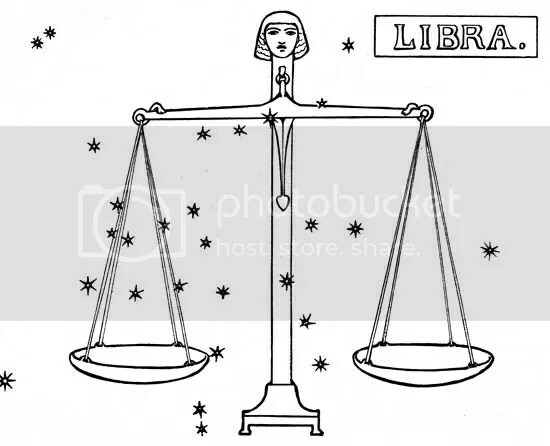 You’ll be sure to make a Libra happy if you gift them some (expensive!) blue or green yarn. This is a throwback post published on February 19, 2011. (and here’s the original ones). These mitts are a long-cuffed, lightweight, versatile accessory that will carry you through Autumn, Spring and Winter. They can be worn pulled up over your arms, or scrunched down around your wrists to keep the cold wind out of your cuffs. They’re wonderfully soft and light, but still give my hands the warmth they need. Wear them with your friends in mind – I always do!